Thirty-seven films from 14 countries, including 11 world premieres and 19 South African films, make up the programme for this year’s Encounters South African International Documentary Festival, which runs in Cape Town and Johannesburg from 9 to 26 June. 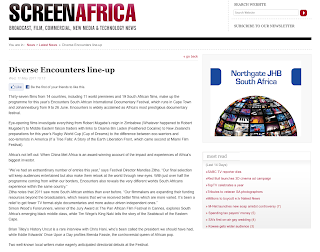 Encounters is widely acclaimed as Africa’s most prestigious documentary festival. Eye-opening films investigate everything from Robert Mugabe’s reign in Zimbabwe (Whatever happened to Robert Mugabe?) to Middle Eastern falcon traders with links to Osama Bin Laden (Feathered Cocaine) to New Zealand’s preparations for this year’s Rugby World Cup (Cup of Dreams) to the difference between eco-warriors and eco-terrorists in America (If a Tree Falls: A Story of the Earth Liberation Front, which came second at Miami Film Festival). Africa’s not left out: When China Met Africa is an award-winning account of the impact and experiences of Africa’s biggest investor. Simon Wood’s Forerunners, winner of the Jury Award at The Pan African Film Festival in Cannes, explores South Africa’s emerging black middle class, while Tim Wege’s King Naki tells the story of the Seabiscuit of the Eastern Cape. Brian Tilley’s History Uncut is a rare interview with Chris Hani, who’s been called the president we should have had, while Eddie Edwards’ Once Upon a Day profiles Brenda Fassie, the controversial queen of African pop. Two well-known local writers make eagerly anticipated directorial debuts at the Festival. Eric Miyeni, who wrote The Only Black at the Dinner Party and was famously fired by SAFM for being too controversial, will screen Mining for Change: A Story of South African Mining, which is sure to generate heated debate. Miyeni directed the film with Navan Chetty.